A-HOTEL.com - Luxury and cheap accommodation in Maloye Lesnoye, Russia. Prices and hotel, apartment booking in Maloye Lesnoye and surrounding. Boasting accommodation with a balcony, Квартира is situated in Kaliningrad. The accommodation is 3. Dom Banya is set in Kaliningrad, 5 km from Kaliningrad Stadium. Located around 6 km from Church of the Holy Family, the guest house with free WiFi is also 6 km away from Königsberg Cathedral. Country House on Parkhomenko 8 has well-equipped accommodation featuring free WiFi in Kaliningrad, 5 km from Kaliningrad Stadium and 6 km from Church of the Holy Family. The accommodation comes with a fully equipped kitchen with an oven, a flat-screen TV and a private bathroom with a shower. Located in Kaliningrad, Halturina 29 features accommodation with a garden, free WiFi, a 24-hour front desk, and ticket service. The property features garden views and is 4. 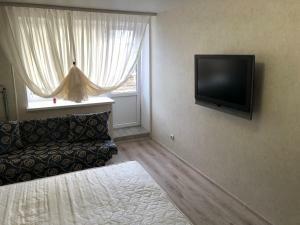 Located 5 km from Church of the Holy Family in Kaliningrad, Евродвушка в новом доме offers accommodation with a kitchen. The property has garden views and is 6 km from Königsberg Cathedral. апартаменты на ул. Alleya Smelykh enjoys a location in Kaliningrad, just 3. Located 3 km from Kaliningrad Stadium, 10 minutes’ drive from Kaliningrad Yuzhniy Train Station and Bus Station, this guest house features a sauna and billiards. Rooms at Kalina Guest House include a flat-screen TV. Located in Kaliningrad, this air-conditioned apartment features free WiFi. The unit is 2. Featuring a garden and a terrace, Дом для отпуска is situated in Kaliningrad and is 3.1 km from Kaliningrad Stadium. Apartment Sunrise is situated in Kaliningrad, 5 km from Church of the Holy Family, 6 km from Kaliningrad Stadium, as well as 7 km from Königsberg Cathedral. This apartment offers accommodation with free WiFi. Судостроительная 120 is located in Kaliningrad, 3.8 km from Kaliningrad Stadium, 4. Boasting accommodation with a balcony, Apartment on Dzerzhinskogo 96 is set in Kaliningrad. The property is 1. Situated 3.6 km from Church of the Holy Family in Kaliningrad, Апартаменты на Автомобильной offers accommodation with a kitchen. Located in the quiet district of Kaliningrad, this hotel offers a sauna and traditional Russian-style restaurant, serving local and European cuisine. Königsberg Castle is an 8-minute drive away. Featuring city views, Apartments Belgorodskay is located in Kaliningrad, around 1.9 km from Kaliningrad Stadium. Set 1.5 km from Kaliningrad Stadium in Kaliningrad, Apartment on Parkovyy Pereulok 2 offers accommodation with a kitchen. Apartment Batalnaya 5 offers accommodation in Kaliningrad, 2.9 km from Church of the Holy Family and 5 km from Königsberg Cathedral. Located in Maloye Lugovoye, Guest House na Lugu provides free WiFi. Boasting a 24-hour front desk, this property also provides guests with a restaurant. Apartment on Pechatnaya offers accommodation in Kaliningrad, 4.1 km from Church of the Holy Family and 6 km from Königsberg Cathedral. Located in Kaliningrad, 3 km from Church of the Holy Family, 5 km from Königsberg Cathedral and 5 km from Kaliningrad Stadium, Apartments on Sudostroitelnaya 17E offers accommodation with a balcony and free WiFi. The property features lake and city views.